Enjoy a relaxing bath with Palmolive Aroma Morning Tonic Shower Gel. This Body wash is infused with Tangerine essential oil and Lemongrass extract which helps to stimulate your mind and spirit in a blissful shower moment. Awaken your senses with an energizing aroma under the shower. Delight your senses with Palmolive Naturals Sea Minerals, enriched with extracts of Sea salt. 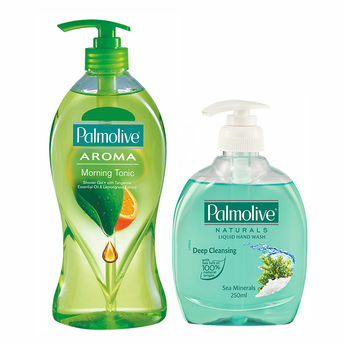 Palmolive Natural Hand Wash Sea Mineral contains naturally derives anti-germ agent that removes 99.9% germs. With natural sea- minerals, it will refresh your skin and will leave your hands feeling clean. This handwash gives long lasting anti-germ protection.